Battery Electric Vehicle (BEV) Market size is estimated to reach USD 425 billion by 2025; according to a new research report by Global Market Insights, Inc.
Increasing prevalence of greenhouse gases along with rising concerns associated with carbon emissions are driving the battery electric vehicle market growth over the projected timeframe. Incentives, tax reductions, and free charging facilities are the main factors encouraging customers to opt for battery electric vehicles. Automakers are concentrating on driving their businesses in countries, which have significant policies for encouraging the electric vehicles adoption. For instance, Norway has introduced a substantial package of incentives to promote zero-emission vehicles in the country. These include exemption from annual road tax, import tax, toll tax, and free parking in municipal areas. Electric automakers are increasingly adopting Lithium-ion batteries for powering BEVs owing to benefits offered including higher energy density, lower maintenance, self-discharge, and no requirements for priming. Electric automakers are also investing in R&D to significantly boost the amount of energy a battery cell can store and bring an electric vehicle’s performance range in line with a gasoline-powered vehicle, thereby escalating the battery electric vehicle (BEV) market share over the study timeframe. Several countries are also focusing on replacing their public transportation fleet with newer vehicles based on electric technology for improving the efficiency along with minimizing carbon emissions. These developments provide significant opportunities for manufacturers to improve their presence in the BEV market. For instance, in 2018, electric bus manufacturer, BYD received a contract for 13 electric buses from the municipality of Southern Italy. The municipality is focusing on promoting sustainable mobility and reducing pollution in the region. The higher costs associated with battery electric vehicles along with concerns associated with long term reliability and driving range concerns of such vehicles may limit the BEV market growth over the projected timeframe. However, industry players are investing in R&D for launching advanced vehicles with higher driving range and lower charging time. For instance, in 2019, Nissan unveiled its upgraded Leaf E+ vehicle with a driving range of 226 miles. The Class 8/Long Haul trucks will account for a considerable share in the BEV market. This can be attributed to the increasing adoption owing to the benefits offered by the technology including lower maintenance and operating costs, reduced noise and vibrations along with smoother driving experience. In addition, industry players are currently offering trucks with improved features for attracting a wide customer base. For instance, in 2017, Tesla unveiled its Semi Truck with automated driving technologies. The heavy-duty vehicles will showcase a significant growth rate of over 9% from 2019 to 2025. This growth can be attributed to the adoption of electric trucks owing to rising pollution concerns from such vehicles. Industry players are focused on launching electric powertrain for trucks with focus on high driving range to attract a wide customer base. For instance, in October 2017, Volkswagen Group announced a funding of around USD 1.7 billion to develop electric drivetrain and cloud-based fleet management systems, thereby providing a positive outlook for the battery electric vehicle (BEV) market expansion. Asia Pacific BEV market is expected to observe momentous growth owing to the prevalence for government policies and subsidies. For instance, in September 2018, Seoul announced a budget amounting to USD 16.2 million for enabling increasing adoption of electric cars. Additionally, the city also announced its plans to provide subsidies for supporting the purchase of around 80,000 electric cars by 2022. 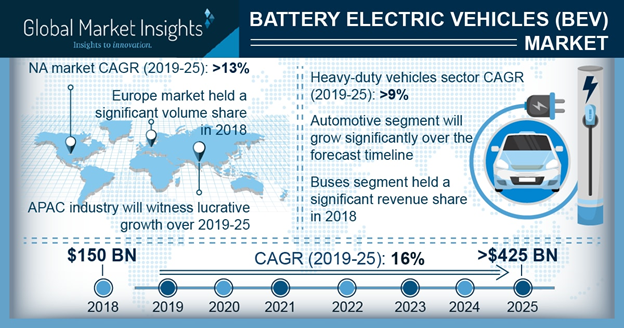 North America battery electric vehicle market will grow considerably at over 13% from 2019 to 2025. This is attributed to the presence of multiple players focusing on offering a wide range of electric vehicles. Favorable government policies, stringent pollution norms along with supporting charging infrastructure plays an important role in the regional share expansion over the study timeframe. The U.S. states including Colorado are adopting stringent emission norms to reduce greenhouse gases by 25% till 2025, thereby positively influencing the market growth over the study timeframe. Some of the key players in the BEV market place include General Motors, Daimler AG, Honda Motor Co., Ltd., Groupe Renault, Volkswagen, Toyota Motor Corporation, BMW Group, and Hyundai Motor Company. New product launches and expansion of portfolio are among the prominent strategies adopted by industry players to enhance their market share. For instance, in March 2018, Daimler AG launched DENZA 500 electric vehicle in collaboration with BYD Automotive for increasing their share in the China electric vehicle market place. Industry participants are adopting product launch as key strategy to enhance their market share. For instance, in March 2018, Daimler AG launched new DENZA 500 in China through their joint venture Shenzhen DENZA New Energy Automotive Co., Ltd. This strategy enabled the company to solidify its positioning in the China battery electric vehicle market place and offer valuable offerings to its customers.